Pain Physicians NY (Brooklyn & NYC) provides a full range of Epidural Steroid Injections (Lumbar Epidural Steroid Injections) as well as advanced pain management services including electrical nerve stimulation for chronic pain among latest cutting edge procedures: Body Composition Analysis, High Tech Shockwave Therapy, groundbreaking Interstitial Laser Therapy. Epidural injections are made directly into the affected area for the purpose of reducing inflammation and relieving pain. 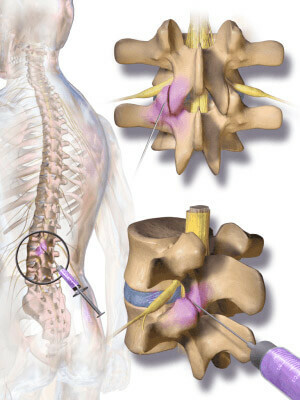 All epidural injections made to the lower spine are therefore considered as lumbar epidural steroid injections. These injections have become a common way of treating lower back problems as well as leg pain recently. The advancements in medical procedures have made the procedure fairly safe. Nowadays, the procedure is even done without the need for general anesthesia. When are lumbar epidural steroid injections necessary? Discs in the spine are arranged in such a way that they can twist and bend to allow for motion. These same discs can also become degenerated with time or due to another condition or injury, causing it to break down. When that happens, the affected discs compress, causing the inner core of the spinal cord to leak out. The intervertebral discs that are damaged consequently lie upon the spinal root and apply pressure on it, causing pain in the affected area. When there is pressure on the nerve root by a herniated disc, chances are one of the ganglia that transmits messages from the legs is affected. This causes a shooting pain down the leg from the lower back called sciatica. While ageing can cause complications with the lumbar region, work, sports injuries or even musician and dance injuries can cause anyone at any age to experience pain in their lower back. Lumbar epidural steroid injections are effective for pain relief around the back pain and can be used when a patient complains of such pain. However, these injections are not permanent solutions, instead providing favorable conditions that could enable the patient exercise other measures. It is mostly used when someone is suffering from chronic pain, and the injections allow them to perform physical therapy that may alleviate some of the symptoms. Lumbar epidural steroid injections usually take about 15 to 30 minutes. You need to lay flat on a table on your abdomen. Prior to the injection, the skin needs to be numbed with lidocaine. The spinal cord is a very important area that you wouldn’t want messed with, which is why the procedure is done under fluoroscopy. Fluoroscopy is a form of live X-ray, unlike regular X-ray, that directs the doctor on the position of the needle and vertebrae. The injection itself constitutes of a steroid which reduces inflammation and a pain reliever to numb the pain of the injection. Subsequently, the injection is painless, even though it is performed while the patient is still awake. Pain relief from epidural injections is almost instantaneous since it’s applied directly to the affected area. It is also faster and more effective than oral pain relievers which have a more generalized effect around the body. Besides pain relief, these injections also have anti-inflammatory capabilities that control inflammation and flush out inflammatory proteins from the affected area. These injections are effective in about 50% of the patients. If there is just a little bit relief, one or two more lumbar epidural steroid injections may be recommended. However, if no relieve is provided with the first injection, there is a big chance that further injections will also provide no relieve, so they are not recommended. Lumbar epidural steroid injections are done in a one or two week interval. This procedure has become very safe in recent years with minimal risks. For example, risk of infection if down to 0.1% and bleeding or nerve damage rarely occurs. A slight headache, also known as a spinal headache, may be experienced due to the dural puncture, but it’s never serious. There is no risk for paralysis from lumbar epidural steroid injections. Severe arthritis of the hip, etc. You have uncontrolled medical problems like diabetes, congestive heart failure, etc. You have a tumor, etc.